Serious sacral spine injuries are a life altering event in more ways than most people can understand. 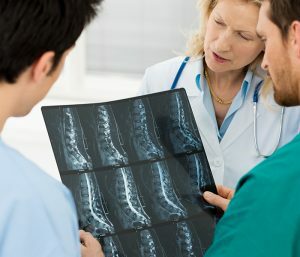 Due to the severity of the injuries, any potential case involving lower spine injury should include an experienced injury lawyer to take the necessary steps to maximize a recovery to make a positive impact after a devastating injury. The experienced New York sacral spine injury attorneys at Frekhtman & Associates has found the most common causes of lower spinal injury are slip and fall accidents, assault, motor vehicle accident, sports injury and high distance fall such as in a ladder or scaffolding accident. What is the Sacral Part of the Spinal Cord? The spinal column is divided into four parts, ordered from top to bottom: cervical, thoracic, lumbar, and sacral. The seriousness of a spinal cord injury is often determined by its location. The lowest vertebrae of the spine form the sacrum. The sacrum is a triangular bone made up of five (5) fused sacral vertebrae. It is located in the pelvis. The sacral spine (sacrum) is located below the lumbar spine and above the tailbone, which is known as the coccyx. Injuries to this area are typically the result of serious trauma, and the sacral (or a pelvic) fracture is usually only one part of a larger set of injuries the person has suffered. The sacroiliac joints are located between the iliac bones and the sacrum, connecting the spine to the hips. The two joints provide support and stability, and play a major role in absorbing impact when walking and lifting. What Are the Effects of Sacral Spinal Cord Injury? Damage to the sacral region of the spinal cord may cause inability to control leg muscle function, loss of bladder control, and loss of sexual function. Most incidents of sacral spinal fracture result in little to no spinal cord trauma and people with a sacral spinal cord injury will most likely be able to walk however it can greatly reduce the range of one’s motion. Prognosis and recovery from a sacral spinal cord injury differs from patient to patient. The difference is due to the type of injury and the level of severity. A positive attitude and regular activity are very important elements of recovery. If regular job duties cannot be performed initially, modified (light or restricted) duty may be prescribed for a limited time. Not having to worry about finances plays a large part in the recovery from a spinal cord accident and so the sacral injury lawyers Frekhtman & Associates will push for the highest possible compensation so hat you can recover without further stress of having to worry about paying your bills or returning to work before you are completely healed. Click here for more information about the care needed after suffering a sacral injury. Here at Frekhtman & Associates, we have found that in many serious sacral injury cases, sometimes the best decision is to bring the case to trial rather than trying to settle with an insurance company. An excellent attorney firm will have solid negotiation and mediation skills, and you want to hire an injury lawyer who is not afraid to play it tough and litigate in the courtroom. We have substantial trial experience in successfully litigating personal injury cases, including all kinds of back and spinal cord injuries. We understand that a permanent lower back injury is a life changing event and it can be hard to meet life’s basic expenses after a serious or catastrophic back accident. Contact us now for a free consultation regarding your rights and options.